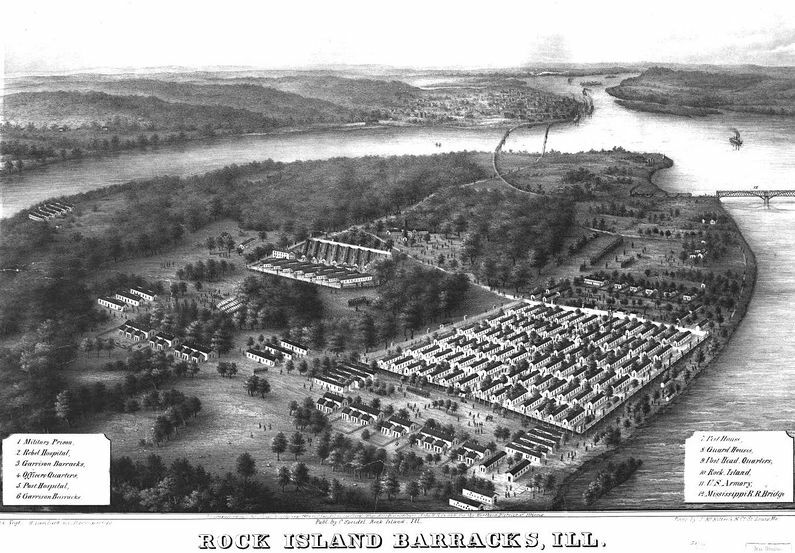 Rock Island Barracks (1863-1865) - A U.S. Army prisoner-of-war (POW) camp established in 1863 during the U.S. Civil War on Rock Island in Rock Island County, Illinois. Part of Rock Island Military Reservation. Abandoned in 1865. Also known as Rock Island Camp. Established in December 1863 to hold Confederate prisoners of war. Housed on a 12 acre site with 84 wood framed barracks surrounded by a 12 foot fence. A separate hospital complex housed the sick prisoners. A total of 12,192 prisoners were housed at the barracks and 1,964 of those died at the camp and were buried at the Confederate Cemetery. At the peak some 8694 prisoners were kept at the camp and were guarded by 2388 guards. The barracks held prisoners until July 1865. Location: Rock Island, Rock Island County, Illinois. This page was last modified 10:06, 16 April 2019 by John Stanton.